Comprehensive Biochemistry, Volume 21: Metabolism of Vitamins and Trace Elements focuses on the processes, reactions, methodologies, and principles involved in the metabolism of vitamins and trace elements, including catabolism, enzymatic synthesis, absorption, and metabolic functions. The selection first elaborates on the biosynthesis of thiamine and riboflavin and metabolism of vitamin B6. Topics include absorption and transport of vitamin B6, catabolism of vitamin B6, mechanism of riboflavin synthetase from yeast, enzymatic synthesis of thiamine, biogenesis of thiazole, and interconversion of various forms of vitamin B6. The book also ponders on the biosynthesis of pantothenic acid and coenzyme A and metabolism of biotin, analogues, folic acid, pteridine derivatives, and cobalamins. Discussions focus on the uses of radioactive cobalamins in metabolic studies, absorption of cobalamins, pteroylpolyglutamates, and biosynthesis of folate compounds, interconversions, and degradations. 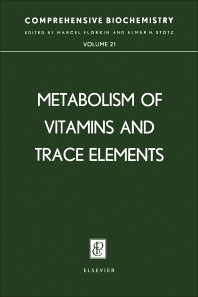 The manuscript examines the metabolism and metabolic function of trace elements, including iron, zinc, copper, manganese, molybdenum, selenium, fluorine, and iodine. The selection is a vital source of data for researchers interested in the metabolism of vitamins and trace elements.